Environmental Protection Agency files suit against City of Houston for Clean Water Act violations. For a copy of our lawsuit, please click here. Houston, TX – Late Thursday, 20 September 2018, the Environmental Protection Agency and the State of Texas filed a lawsuit against the City of Houston for illegal discharges of pollutants and failure to comply with the terms and conditions of their Texas Pollutant Discharge Elimination System permits (TPDES). 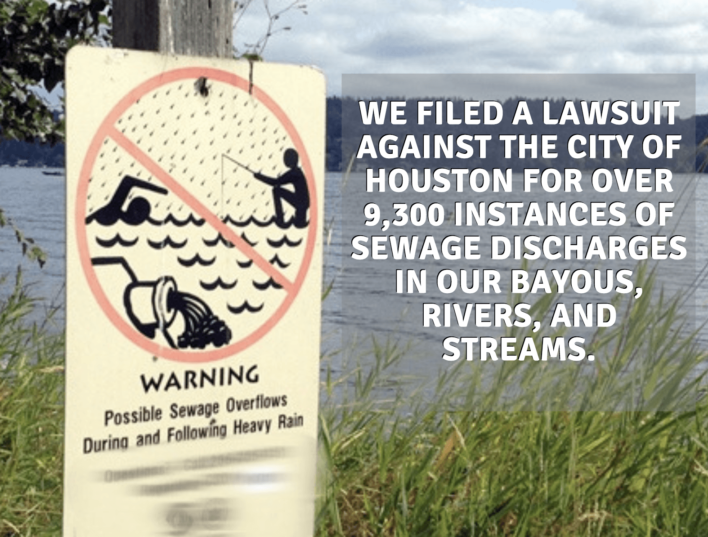 The EPA and State of Texas filed a lawsuit against the City of Houston late yesterday that targets the precise issues raised in Bayou City Waterkeeper’s July 23 notice of intent to sue. Given the timing of the EPA and State’s lawsuit, on the 59th day of our 60-day notice period, Bayou City Waterkeeper strongly believes that our notice of intent to sue prompted the EPA and State to finally take long-needed action toward resolving the City’s wastewater treatment and disposal problem. By filing its lawsuit late yesterday, the EPA and State have signaled to the public that they want to take charge of resolving the City’s problem. But this comes with a major caveat: the EPA and State have asked the Court for an indefinite, blanket stay on all litigation. Bayou City Waterkeeper’s notice of intent to sue and lawsuit are designed to force the City to resolve its indisputable sanitary sewer overflows problems sooner rather than later (or worse, never); if the Court grants the EPA and State’s request for an indefinitely delay, it will undermine any hope that the City will meaningfully resolve its problems any time soon. Bayou City Waterkeeper therefore plans to invoke our right under the Clean Water Act to intervene in the EPA’s lawsuit and oppose the EPA’s request for a blanket stay on all litigation. By intervening, Bayou City Waterkeeper intends to make sure the EPA and City fully resolve the City of Houston’s sanitary sewer overflow problem. The delays in resolving this problem so far (according to the EPA and State’s complaint, these problems stretch back to at least 2005) underscore how important it is for the Court to refuse any stay and impose strict deadlines, and hold both the EPA and City to them. Bayou City Waterkeeper is committed to using all available legal tools to make sure the City’s problem does not fall through administrative cracks and is fully resolved, to improve both water quality and quality of life for local residents for decades to come. For a copy of EPA’s lawsuit and motion to stay, please click here.